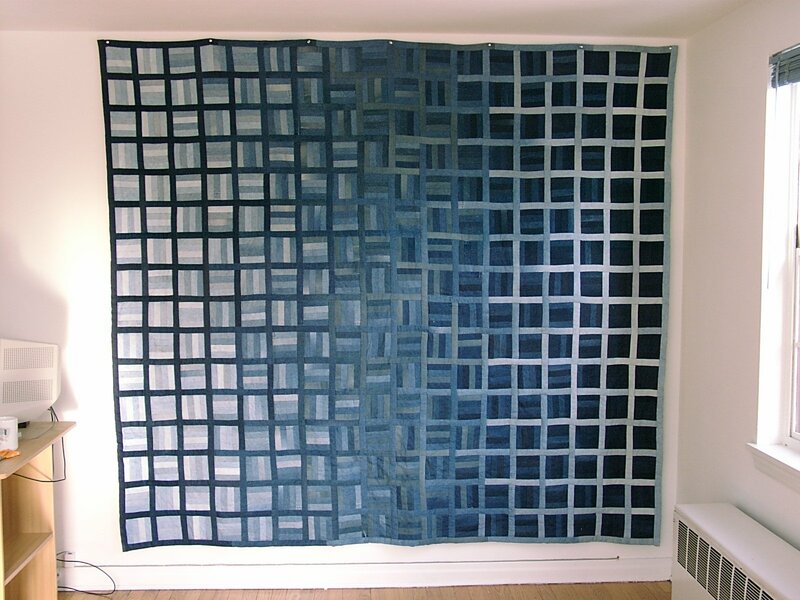 approximate size 81" x 91"
This quilt is made out of blue denim in various shades, including some remnants of new fabric, several pairs of cut-up faded raggy blue jeans of my own, and several pairs of used jeans that I bought at local thrift shops for a couple dollars each. 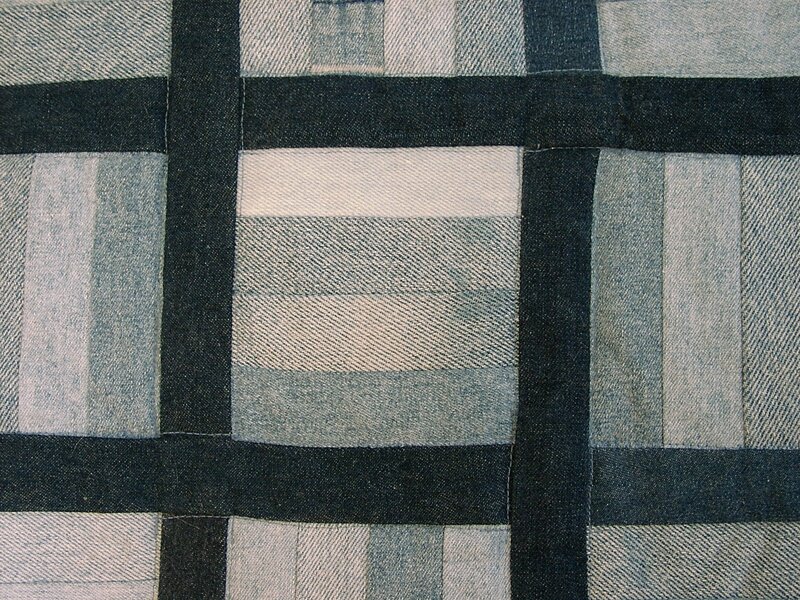 Sewing with a fabric as heavy as denim presents some interesting challenges to the quilter. The main problem is that typical block-based quilt designs would result in seams that are too bulky at the points where the blocks meet. If you look closely at this design, you'll see that there is no block. 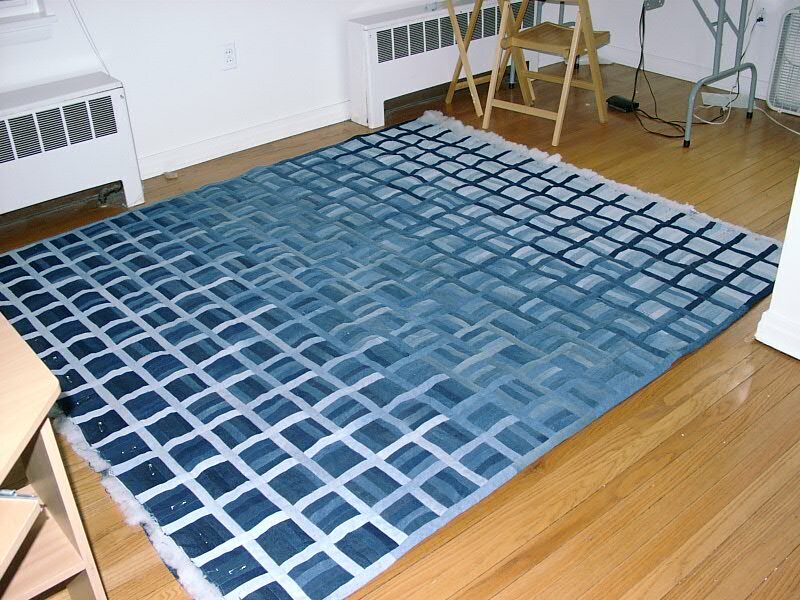 The square pieces are connected with the longer strips in a continuous basket-weave pattern. From a topological point of view, there are points where three pieces meet, but no points at which four or more pieces meet. 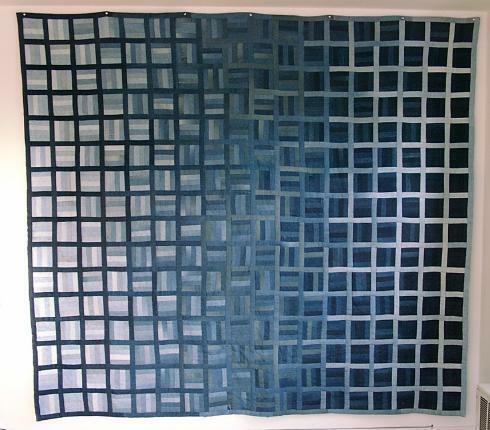 The lack of a block meant that figuring out how to assemble this quilt was also a bit tricky. I essentially ended up sewing each square chunk and strip individually onto the larger section of the top, starting in one corner and working diagonally back and forth. Here's a diagram showing how it worked -- the red shows seams left partially open in order to accomodate the inset of the basket-weave pattern. 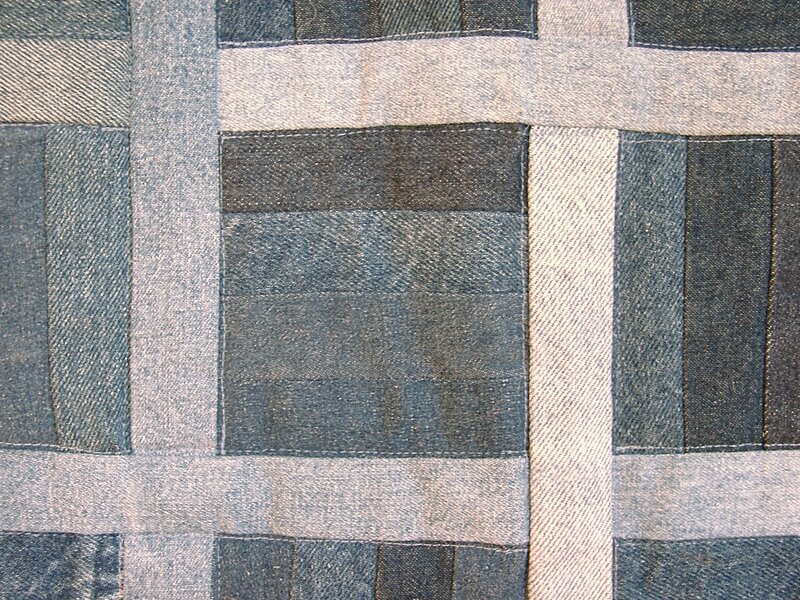 The seams were pressed towards the basketweave strips and I outline-quilted alongside them, giving them a slightly raised three-dimensional effect. This is visible in the detail photos below. More close-up detail of another part of the quilt. Slinky the cat naps on the quilt while it's still under construction. This quilt is so heavy that it was quite a chore to manage it in the sewing machine. 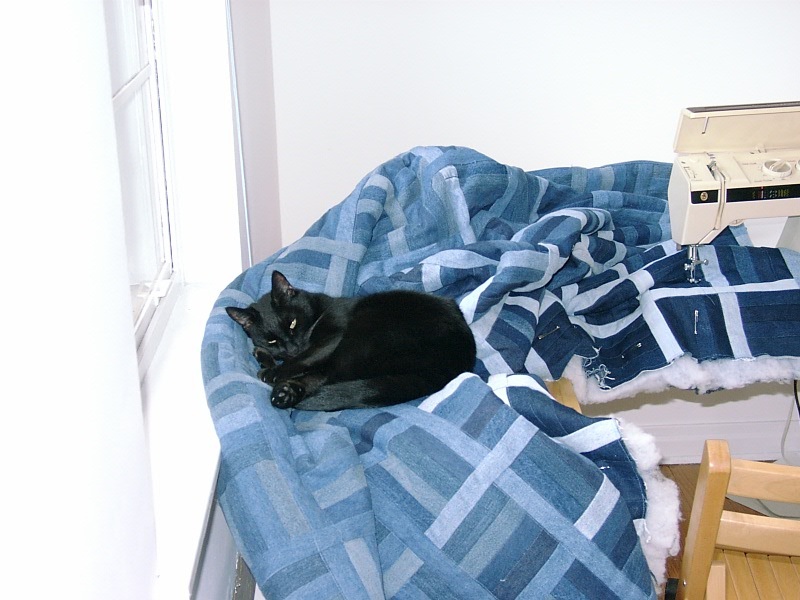 I used a small folding table next to my main sewing table to help support its weight -- this is what Slinky is resting on. Another shot of the quilt under construction. Copyright (c) 2000, Sandra J. Loosemore. All rights reserved. 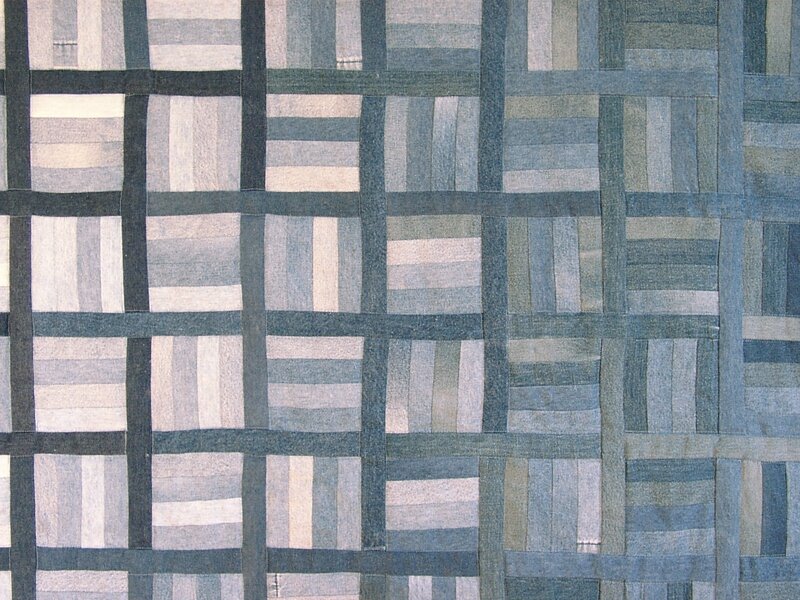 Back to the main quilting page.